Parenting is insanely hard, and it can be intensely isolating. When my husband and I decided the he should leave his traveling job shortly after I went back to work full-time, I don’t think he anticipated the isolation he’d feel. As much as I knew, I wasn’t much help there either. I’m a natural loner and enjoy being by myself quite a bit. So, it never really bothered me too much. My husband had to spend a lot of time searching for fulfillment in his new role. 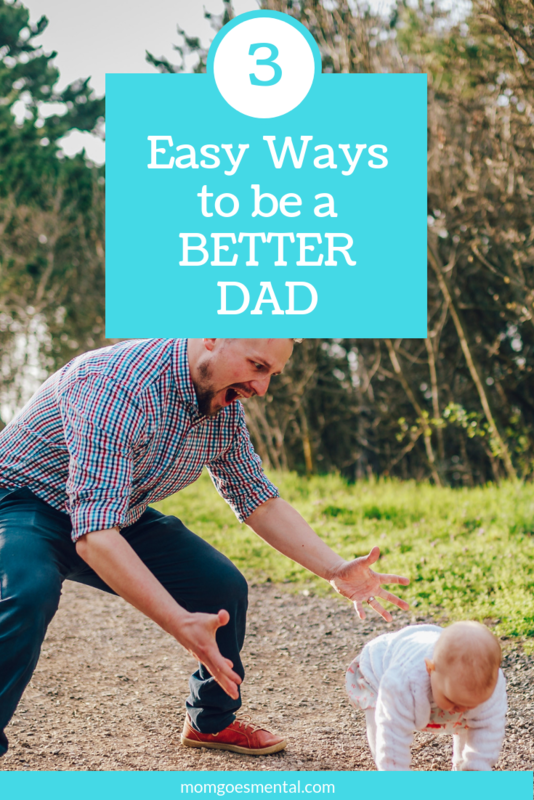 On my end, I used a few different strategies over the years to encourage him and help him be a better dad. Sometimes all it takes to make someone’s day better is to tell them they’re doing a good job. As a former stay at home mom, I know all too well how incredibly difficult it can be. I try to offer my husband encouragement throughout his day, and I like to think it helps him to be a better dad. I also purchased a Rad Dad Box for him for a few months last year. He was at a really low point and struggling with a lot of personal issues. He didn’t think he could be a better dad—he didn’t even think he was a good dad. Rad Dad Box was amazing for him. Not only did he open a special box just for him, but it was filled with the positive message that he was doing a good job. There was even a special treat inside just for him. Connecting with a tiny human whose primary functions are to eat, sleep, and cry is difficult. The frustration a baby feels at not being fed at the exact moment they decide they’re hungry can easily feel like a small parenting failure. Rad Dad Box made connection just a little bit easier. Without having to get to the bookstore or travel through the toy aisle with 3 kids in tow, a box arrives every month filled with just those connective activities. There are even ideas and tips to make spending time with your baby even better. It’s funny how something so seemingly small, a subscription box for Dad and baby, could have such a positive impact on our lives. But helping to foster connection between the two of them really helped my husband to be a better dad. The entire purpose of Rad Dad Box is to encourage bonding between Dad and baby. While our older children have an established relationship with their dad, babies can seem to take, take, take. It can feel very thankless. By including activities and guides in each box, Rad Dad Box gave my husband some direction on how he could nurture their bond. It provided that reinforcement that he needed, and our youngest went from his baby to his buddy. I could tell him how well he was doing all I wanted, but there’s always an assumption of bias there. He never truly believes me, I think. However, when he could see for himself the positive effect his time was having on the baby, it clicked for him. Deal Alert! Use MOMGOESMENTAL for 10% off the first month of a Deluxe Rad Dad Box subscription. Subscribe now! Get your subscription to Rad Dad Box now and follow along with other rad dads on Instagram and Facebook! Great suggestions indeed! I think I’m going to buy the rad dad box for my brother soon! Wow! What an AMAZING idea for dads! This is so great and I’m glad it’s available for folks to use. Wow..Rad Dad Box sounds wonderful. A perfect way to help daddies form their bonds with their children! I love the idea. I think that is a great idea. I didn’t know something like that existed. This is such a great idea! I think dads are sometimes forgotten in the parenting process, but they’re so important in a child’s life too! If you think about it moms are able to reach out and ask for support so much more than dads are. I love the idea of this box and automatically wanted to get one for my husband. Thank you for sharing the idea. You’re so right! There’s a lot of social stigma around men/dads admitting they need help. It’s amazing to see companies putting the focus on how valuable dads are. My little guy loves books. How cool that this box helps dads connect with their kids. Dads are definitely important! The box sounds amazing and great resources for all dads. Thanks for sharing. This is a great and really sweet post. Affirmation are so important and I’m happy to read that you include them! These are great tips for parents. Thanks! I think there is a huge cultural pressure for men to not admit their need help or feel a bit low. I’m glad that my husband had worked so much to get to a place where we can talk about his mental wellbeing openly without fear of hurting his pride or ego. I hope more men can get to that place! These are great tips for being a good dad. All of these are very important. Affirmations are key to create strong adults. So sad that society rather to kick a kids soul to later deal with the aftermath in adulthood. Good post!